I don’t write enough about what goes on here at home on Scoraig so here is a run down on where my electricity comes from. 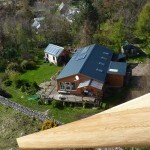 I have two windmills and a collection of solar PV panels. 800 Ah Rolls 4000-series battery and 48 V and two Outback VFX 3 kW inverters. The big windmill charges the 48 V battery via a couple of heaters in series. We get very little heat in low winds but almost all of the power goes to battery charging with very low cut-in around 60 rpm. As the current increases to (say) 20 A we get about 1000 W to the battery and 300 W of heat. 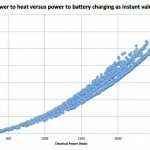 When it reaches 40 A we get 2400 W at the battery (assuming 60V) and 1200 W of heat. The heat (combined with waste heat from cooking) is sufficient for our well insulated house most of the time. I prefer the windmill should not go a lot higher output than that, but it’s turbulent site in NW gales so we do see much higher surge outputs and there is trip that brings in extra heaters as a braking load when the voltage reaches 140 V (7.5 kW). I had a bad accident with this windmill (tower buckling) in a bad storm last January, and nowadays it is governed to about 1 kW average into the battery. It looks lazy but it does all we need. 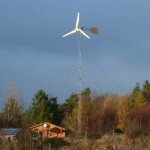 The smaller windmill is an AWP from Zimbabwe but the blades are locally made from wood. It runs through an MPPT controller (I have tested both Classic and Tristar) that enhances the peak output to about 1500 watts. The Solar array consists of 4 strings (pairs) of big 240 Wp 30 V modules and 2 strings (fours) of little 80 Wp 17 V modules totalling about 2.5 kWp. These feed into the battery, and surplus power (wind and solar) is dumped to hot water using a Tristar PWM diversion load controller. When the water tank is hot, the excess power is diverted to AC heating loads using a phase control SSR. We also have some evacuated tubes for hot water. Electricity consumption is running at about 6500 kWh per year. (The UK domestic average is 4200 but I also run my business and the extended family house next door). We do most of our cooking with electricity, using a kettle, toaster, microwave, induction hob and halogen oven. We also recently replaced the gas oven with a big electric oven. When the wind stops and there is not much sunlight the batteries get a bit of a fright, and I have to fire up a diesel generator. This has run for an average of 150 hours per year over the last two years, feeding about 2-3 kW of power into the system. This entry was posted in my own projects, Scoraig, wind systems tutorial. Bookmark the permalink. Are you required to get planning permission to erect your machines? Cool project! It amazed me! I guess, i will have never done something like this. How much time did you spend on it? I see some similar inventions, but it was made by machine, if I not mistaken schneider http://hardware.eu/schneider supplies stuff for such things! I also want to ask about overvoltage. What protection system do you have if it is happen? This is what I do to be honest. 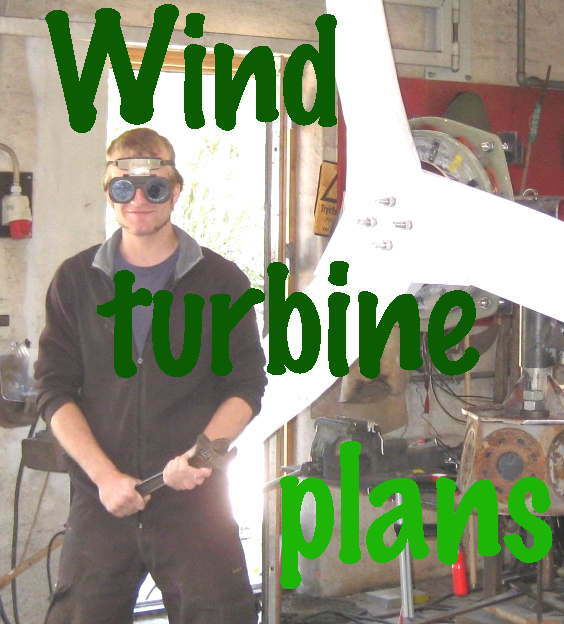 I make wind turbines and teach and write about it. 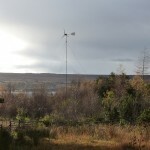 I install and repair off-grid systems and sell stuff including hydro turbines. Yes Schneider do make charge controllers but the Morningstar ones are better. See charge controllers in the menu bar above. My system is not too vulnerable to high wind turbine voltage as there is no MPPT controller but I do still have a trip that brings in an extra heater at 140 volts to try to prevent overspeeding. Lately since I modified the tail a year back this has never tripped anyway. I use Morningstar Tristar controllers in diversion mode to control battery voltage. I’ve been thinking over your series-resistor solution…it could be a good, low tech answer to people, on this side of the ocean, you wonder how to use one of those old 32 volt DC wind turbines, given the lack of 32 volt appliances; simply wire an appropriate water heating element into the battery circuit and use the turbine to charge 24 volt batteries. That way, the fields would attain their full values of magnetic flux, useful, interruptible heat energy could be stored in hot water, that is always in demand, and the large choice of 24 volt equipment, including inverters (32volt inverters are now quite rare) could be exploited. Sometimes, simple is quite brilliant…thanks for describing this. 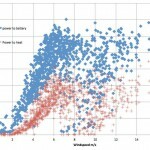 Interesting system…what are your max and min wind speeds / months ? I don’t suppose that, at your latitude, there can be a lot of solar available during Dec. jan. , eh ? I think the annual average is between 5 and 5.5 m/s (11-12 mph). I used to keep records but lately I have lapsed. Mostly the minimum monthly is above 4 but we did have a couple of Decembers in a row that were 3.7 m/s and they were hard on the generator. They were a few years back though. Interesting…so you hit the solar minimum at the same time as you hit the wind speed minimum. That puts a fair bit of stress on the system. That idea of putting resistors in series with your batteries is something I had never considered. Also, what I find most interesting, in a discussion of off-grid systems, is the type of energy utilization that happens; the mix of AC vs DC loads, and so on. For instance, “solar” DC refrigeration is now available (like Sunfrost, SunDazer, etc.) which is super reliable and super efficient. In my humble opinion, using as much DC frees us from the inefficiency “tax” that comes along with using inverters. Another question, if you’ll be patient with me…you say that you use an induction cook top; I’ve tested one and have found it to be much more efficient than a resistance cooker so, all in all, I think they would be great for cooking on off-grid systems . But, I’ve wondered whether it might place a fair bit of stress on the inverter used to power it , due to the power factor,(my own was tested on utility power)… any comments here ? Yes mostly wind and solar do complement each other pretty well but there are exceptions. Putting resistors in series is a pretty radical solution as most people would want to control the destination of the wind energy more whereas this gives uncontrolled heat that varies with the square of the charging current but the relaity is that it matches demand not too badly as we have more energy to spare for heat in stronger winds and the main thing is that it is extremely simple and therefore cheap, reliable and efficient compared with using MPPT devices etc. Dc devices are all very well but its a small market so there is less choice in terms of price and performance than if you join the wider world of AC appliances. In the old days I did not have an inverter but did everything with 12 volts. Those days are long gone and it makes sense to invest in a quality inverter that can handle everything you canthrow at it with good efficiency and then organise the user loads using AC voltage distribution. I don’t worry about stressing my inverter with an induction hob, no. If it can’t handle that then I’d need a better inverter.